This entry was posted in milwaukee, Street Photography, Urban. 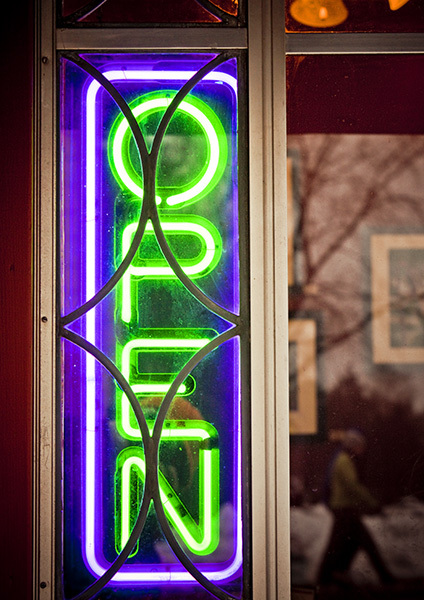 I love this picture with its open sign and the reflection of the street into the interior of the restaurant. The sign takes its real sens here, as if there is no more border between inside or outside. No more interference. Colors tell this story: vivid and “modern” colors of the Open sign (left) opposed to sepia tones (right). May be the real world and the illusion of the world. Colors tell this story: vivid and “modern” colors of the Open sign (left) opposed to old sepia tones (right). Does it mean the real world and the illusion of the world? This is one of those image you “discover” during post processing and then like it a lot. WHen I was shooting, I was shooting without this intent (of a person walking by) and then found it after the shoot. Lesson: Remember this and intentioanlly put a person in these (wait for it to happen) the next time. Thank you so much for your support and for encouraging me to keep it up. It means a lot. I will try and post another image in the next couple of days. Hope to see you soon. Keep it going, my friend! Whoa! You have opened with fireworks. Each of your postings is evocative and teases my imagination. Art without wonder is merely craft Usha… These are wonder-filled. Ted, really glad to see you here. Thanks so much for your very gracious comments as always.